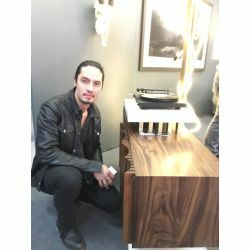 Jessie Nelson is a musician, audio engineer and furniture designer. For over a decade he’s composed, produced, and performed music around the world. In 2007, his technical and creative interests collided to inspire a career in furniture design and fabrication. He was soon creating works for the likes of MoMA, The Ace Hotel, Roman & Williams, Serato and Warby Parker among others. But his on-going relationship with the Ace Hotel and Roman & Williams can perhaps be credited with solidifying his continued passion for furniture.